Renowned British chef Simon Rimmer made his debut in the UAE last year with The Scene, a trendy eatery on the fourth floor of Pier 7 in the Dubai Marina. The food at Rimmer’s first venture outside the United Kingdom is classic British grub with a modern twist. You won’t find Rimmer toiling away in The Scene’s kitchen – he lives in England full-time – but you will see his influence throughout the restaurant. Rimmer designed the dishes with head chef Dominic Robinson, and the result is a well-rounded menu of British favourites (with a few surprises) that will keep you coming back. 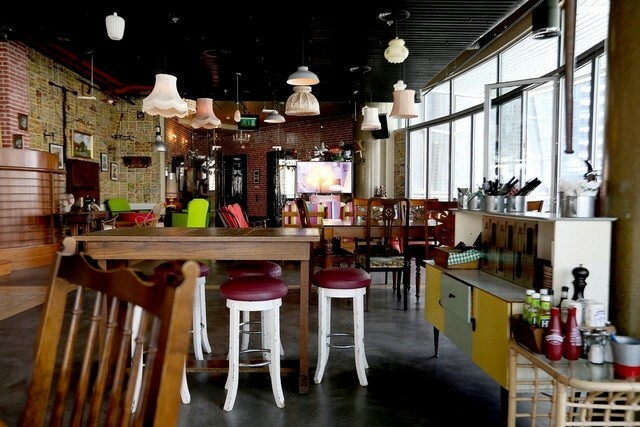 The Scene’s expansive interior is filled with vintage wooden tables and second-hand chairs. There’s a 1950s-era mock living room at the front – complete with a fireplace and vintage sewing machine – that you’re more likely to find in a crazy old aunt’s house than a trendy Dubai eatery. The walls are plastered with comic strips, which add to the playful vibe. The entire space – eclectic, colorful and inviting – works and instantly makes you feel welcome.